Sometimes when trying to explain a new game to someone, its easiest to use other similar games as a reference to it. For instance, I would describe “The Last of Us” as a mix of “Uncharted 2,” and “Resident Evil,” with a little “Splinter Cell” tossed in. In trying to do that with “Knife That Guy,” I found my reference concoction overflowing with comparisons to titles like “Bomberman,” “Pac-Man,” “Hotline Miami,” “Q-Bert,” “Temple Run,” “Stealth Assassin,” and a few others, when I realized that technique wasn’t going to work. 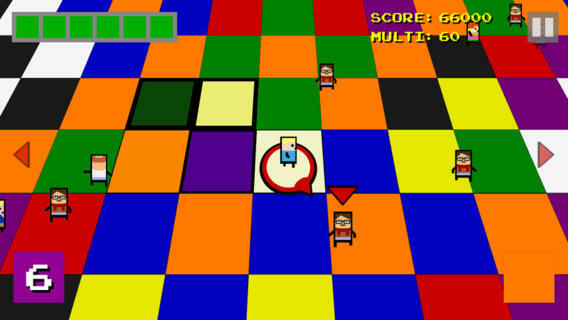 It’s also pretty unnecessary as at its core, “Knife That Guy” is a simple game that sees you play the role of a guy with a knife patrolling a pressure operated floor of colored tiles with the sole objective of finding the titular that guy and…well knifing him. You’ll be able to recognize that guy as he’ll have a red arrow above his head, which is handy considering the floor is populated with a variety of people who are not that guy, who you do not want to knife, as doing so depletes your lifebar. The challenge, and fun, of the game comes through the fact that solely knifing your target is a tall task considering the fact you cannot stop or slow down, and that the other non-knifable people surrounding your target, constantly get in your way and force you to think on your feet at all times. Even reaching your target only contributes to the burden, as the game speeds up upon each successful kill and more innocents with various walking paths populate your space. Play it too cautious though, and take up too much time, and the tables turn so that you are now the hunted guy with someone looking to knife you. Assisting you is a dash maneuver which propels you several feet in your chosen direction, and a bomb which launches knives in every direction. Both of these moves are helpful in the right hands, but if not used carefully can actually harm you more than help. Thankfully they were designed that way, and their risk of danger is not instead the cause of control issues, which are actually excellent. The brutality of “Knife That Guy” extends beyond its challenge, as the game is pretty violent, even if it is in a pixelated cartoony way. Surely that will bother some people, but the consequences of stabbing an innocent are immediate and severe, making you feel incredibly miserable every time it happens. It’s not exactly a poetic analysis on the duality of man, and a moral guideline for all games to follow, but it does emphasize consequences for your actions more than many games do. In a way “Knife That Guy” is an incredibly violent puzzle game that will have you going one more turn for hours on end, and getting a little better each time out. It goes beyond the average mobile puzzler though with its action/arcade elements that provides an adrenaline rush with every successful maneuver. The developers did a fantastic job of taking an incredible, but simple, concept, and honing every single style and gameplay element so that they all serve to enhance it. You may be able to learn the game in a few minutes, but it’s that creative craftsmanship that ensures every round will be a new experience. “Knife That Guy” is, by its own design, a very odd game. Somewhere underneath its playful dementia, though, lies an experience as old as gaming itself, and crafted to a level you’d expect from so many years of experience to build upon and reference. In that way it may be most like “Hotline Miami,” but truthfully “Knife That Guy” doesn’t have many peers, and has no competition for app of the week.